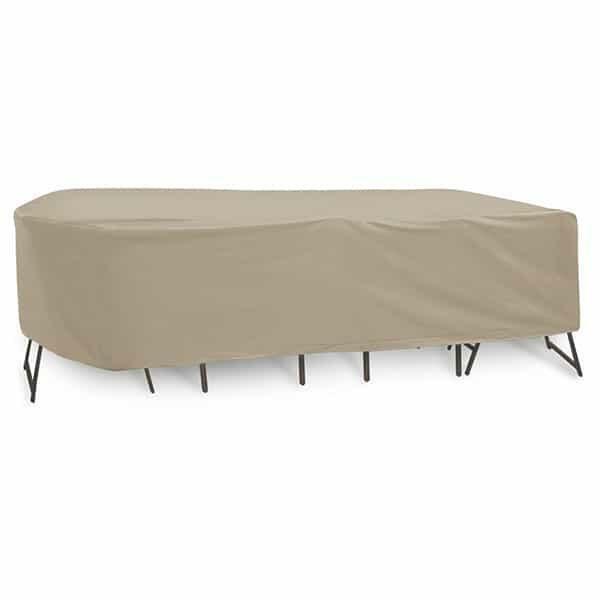 Furniture covers are the single most important measure that owners can take to prolong the life of outdoor furniture. But, lugging huge tarps and wrapping each chair and each table by hand seems like too great a task to many. Looking for an easy to apply and easy to remove furniture cover? Try PCI. This cover fits over an entire oval or rectangular shaped dining set with six chairs. That’s right- all of the components, wrapped neatly together. This cover does not feature an umbrella hole, which makes it easier to apply and remove for even overnight protection. The cover is durable and reliable. It is made with two components: one, a rugged treated vinyl exterior and two, a soft compressed fleece interior. Protect your outdoor dining set investment!